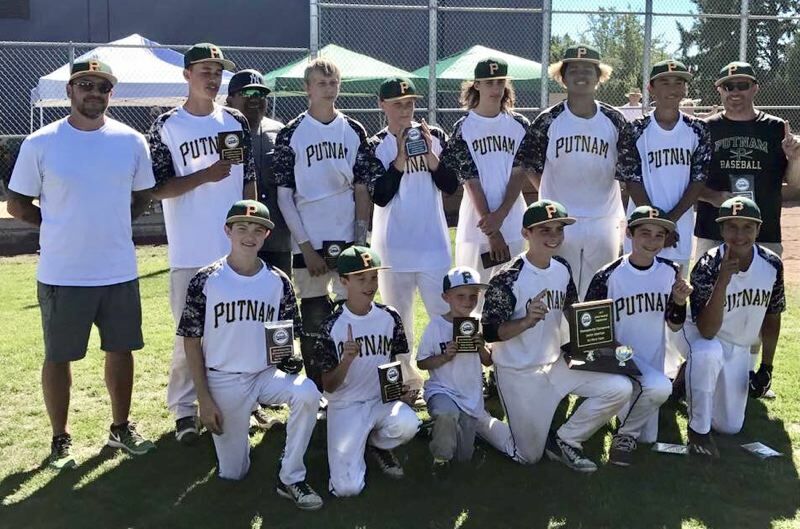 Austin Keel's grand slam home run highlighted a seven-run outburst in the first inning as Putnam clinched the Junior Baseball Organization's Senior American state championship with a 13-5 victory over Gladstone Sunday in Hillsboro. Evan Carrillo added two homers, including a sixth-inning grand slam, helping Putnam (32-7) complete an undefeated run through the 12-team, double-elimination tournament at Hillsboro's Poynter Middle School. Keel started on the mound for Putnam and pitched the first 5 2/3 innings, allowing five runs (four earned) on three hits with three walks and eight strikeouts. Jayden Junta tossed 1 1/3 innings of no-hit relief with two strikeouts to close out the win. "The championship game was picture perfect," Putnam coach Mick Carrillo said. "All season long, we'd been talking about coming together, staying together, and working together. These guys have known each other for a long time and it's a core group that I expect great things from at the next level. "They're just a great bunch of kids and just solid athletes, and good people too. I can't say enough about their teamwork with one another and picking each other up, staying positive, and … it was just one for the ages." Putnam sent 11 batters to the plate in the first inning and scored seven runs on two walks, a single, a hit batter, and three consecutive home runs. Jakeob Barnett and Austin Hayes each drew walks before John Foglio's one-out, RBI-single plated Barnett with the game's first run. After Junta got hit by a pitch to load the bases, Keel drove a 2-2 pitch to left field for a grand slam, Carrillo followed with a solo homer to right, and Blake Oren capped the uprising with a solo homer to center to give Putnam a 7-0 lead. Putnam added a run in the second when Barnett led off with a single, went to second on a ground out, stole third, and then scored on Hayes' grounder to the pitcher. Keel took a no-hitter into the fourth inning when Gladstone scored two runs on two walks and a two-run single. In the sixth, Gladstone scored three runs on a walk, a hit batter and two singles, and then Putnam answered with five runs -- the first four runs coming home on Evan Carrillo's grand slam to right. "That took all of the wind out of Gladstone's sails," Mick Carrillo said. Putnam opened the tournament with a 20-1 rout of Lincoln. Barnett finished 4-for-4 with a double, two homers and four RBIs, and Junta went 3-for-3 with a double, two homers and seven RBIs to lead Putnam's 14-hit attack. Junta then threw a three-hit shutout with 11 strikeouts and hit a three-run homer to carry Putnam to a 4-0 quarterfinal win over Banks. In the semifinals, Hayes tossed a five-hitter with nine strikeouts, and Barnett and Keel each hit homers as Putnam rolled to a 13-0 win over Canby. In four tournament games, Putnam outscored the opposition 50-6. Barnett finished 7-for-12 with three doubles, two homers and six RBIs, and Junta went 4-for-10 with two doubles, two homers and 11 RBIs. "I just run out of words to describe it, other than it was just a magical season," Mick Carrillo said. "Coming together as players and coaches and all the families, making that final run and taking home the championship, and then celebrating afterward, it was fantastic. "For ever and all time, this Putnam team was the 2017 JBO Senior American state champions, and nobody can ever take that away."